“O, swear not by the moon, th’ inconstant moon..." or your favourite dancers. It is now four years since we discovered the Royal Ballet's wonderful repertoire and one of the first productions we saw was Kenneth MacMillan's classic Shakespeare adaptation ROMEO AND JULIET with Steven McRae dancing Romeo. Steven soon became our favourite male dancer, a performer with real star quality, and when it was announced he was dancing the role again this year, tickets were snapped up. However on his last day of filming CATS, McRae had a knee injury which required a surgical procedure. "Romeo, Romeo... wherefore art thou Romeo?" He's resting his knee that's where he is. 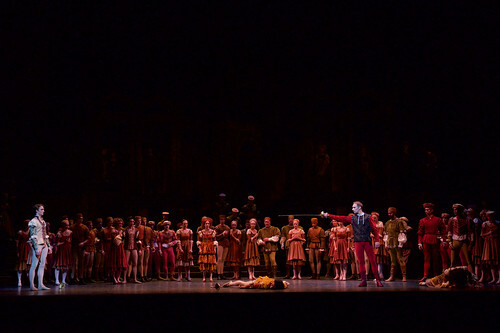 This is sad as we also missed him last year in SWAN LAKE and MANON through being out injured. Anyway where were we? Oh yes, "Two households both alike in dignity..."
McMillan's production originated in 1965, his first full-length work for the Royal Ballet. He had expanded a pas-de-deux filmed for Canadian TV with the young pairing of Lynn Seymour and Christopher Gable and was determined they would be his original star-crossed lovers. But the production was due to tour the USA after it's premiere and the American promoter wanted the star wattage of Margot Fonteyn and Rudolf Nureyev and the Royal Ballet management gave in, so Gable and Seymour were demoted to the second cast and even had to teach the two more famous dancers some of the moves which must have been particularly galling. McMillan felt betrayed by the decision and left the Royal Ballet the next year to run the ballet company at the Deutsche Ballet in Berlin. He would return to Covent Garden as the Artistic Director in 1970 but resigned seven years later to be the company's principal choreographer. I still find it remarkable that a production can remain for 54 years in a repertoire - no matter how hard you look you will not find Franco Zeffirelli's MUCH ADO ABOUT NOTHING or Peter Wood's LOVE FOR LOVE at the National Theatre or Peter Hall's THE HOMECOMING at the Royal Shakespeare Company. But it's a minor quibble as ROMEO AND JULIET is still a glorious creation, involving from the start with a thrilling choreographed sword fight in the city square which ends with five dead bodies piled up centre-stage, McMillan's Verona is always a hair's breath away from danger. 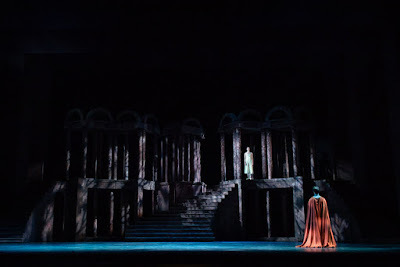 John B Read's lighting and the original evocative set design by the late Nicholas Georgiadis combine to give you an immediate understanding of place while McMillan's truly thrilling choreography is realized by Julie Lincoln and Christopher Saunders. Sergei Prokofiev's score sounded excellent played by the Opera House orchestra under the baton of Paul Murphy. Steven McRae's replacement was Ryoichi Hirano and Juliet was danced by Akane Takada - who always seems to be on when we visit. Hirano was technically fine but was dramatically colourless; Takada embodied the full arc of Juliet, delicate and joyful at the start, troubled and passionate in love and death at the end. 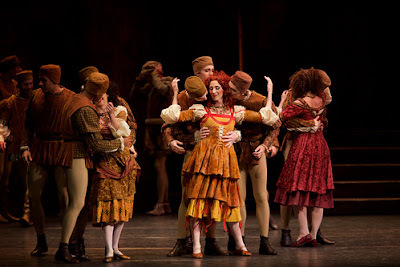 As usual, there was fine support from James Hay and Bennet Gartside as the deadly rivals Mercutio and Tybalt, Kristen McNally and Thomas Whitehead were fine as Juliet's controlling parents, and there was great scene-stealing from the vivacious strumpets led by Itziar Mendizabal. 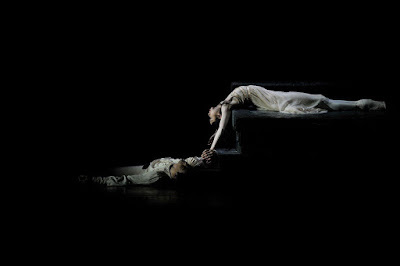 Despite Steven McRae's absence, ROMEO AND JULIET was wonderful to see again and to relive Kenneth McMillan's creative genius. 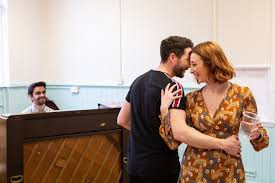 Producer David Merrick, trying to reclaim his King of Broadway crown, decided to produce 42nd STREET, adapted from the film by Mark Bramble - his ex-office boy - and Michael Stewart. Stewart had written the lacklustre book for MACK AND MABEL which Merrick produced and Gower Champion directed. The show flopped and Champion swore they would never work together again. But six years and two more flops later, Champion signed up for 42nd STREET but, again, he and Merrick clashed. Aware that word had reached the NY critics that 42nd STREET had problems in it's Washington tryout, the paranoid Merrick cancelled all the Broadway previews to stop the press sneaking in but insisted the actors still perform to the empty auditorium. One of the cast suggested that they all bring in any cuddly toys they had one night and played the show to them sitting in the front rows! These non-previews also covered up the sudden absence of Champion, but he was in hospital having succumbed to a blood disease that he had been fighting. Opening night arrived and Merrick *had* to let the press and public in - but that morning, Gower Champion died. Merrick only told the writers and asked Champion's family to keep silent. After acknowledging the rapturous ovation at the end of the show, Merrick announced to the stunned cast and audience that Champion was dead. The next morning 42nd STREET was front-page news and Merrick had his hit. There is still conjecture that he made the announcement this way knowing it would make any bad reviews redundant. The show transferred to London in 1984 and was an instant hit, giving London the sort of huge Broadway show it had not seen in years. I saw a preview and was swept away by Champion's machine-gun tap choreography, Theoni V. Aldredge's lavish costumes and the larger-than-life performances of Georgia Brown as Dorothy Brock, Clare Leach as Peggy Sawyer and Carol Ball as Anytime Annie. 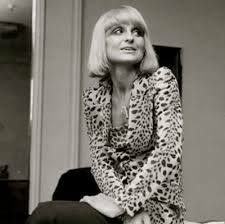 I knew Carol from Richard Eyre's company at the National Theatre so eventually her dressing room became a second home. 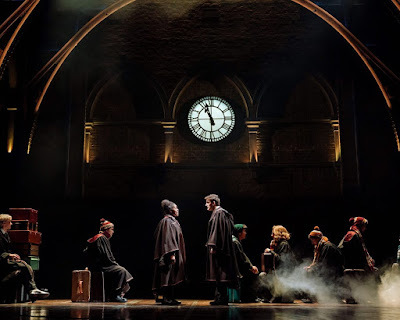 Flash-forward 33 years and it was a very strange experience to see the show on the same stage when it was revived in a slightly revised version. I had not wanted to see it to be honest... but there I was at the end, clapping like a seal and beaming. Randy Skinner had filled out the choreography for some added numbers and the show was directed by Mark Bramble, who has since died. 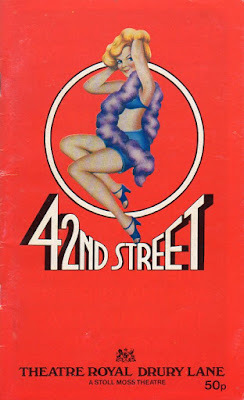 Bramble didn't revise his book so it remains as thin as ever - 42nd STREET is definitely the last musical to go to if you want 3-dimensional characters; it literally jumps from song to song like a tapping mountain goat. But the show knows it's strengths and the songs - and the thrilling dance routines that accompany them - just keep on coming. The Harry Warren and Al Dubin songs might not be the best songs of the 1930s but boy, they have tunes. From the famous opening moments - when the curtain rises and pauses so you can focus on the ensemble's furious tapping feet - the show just picks you up and whirls you through it's classic backstage tale. 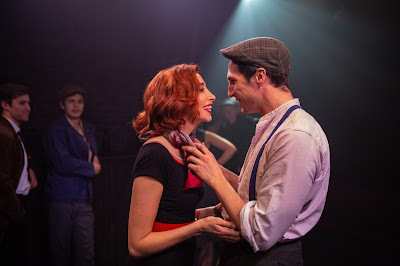 Oddly enough, what stuck me during the revival is the desperation behind it all: if PRETTY LADY fails Marsh faces a bleak future, Peggy has only her no-hope existence in Pennsylvania to return to, and the dancers all face unemployment and the breadline. It's odd that I never really noticed it in the 1980s. Most of the available video footage is of the revivals but 42nd STREET is here because of the impact that original 1984 production had on me so here is the wonderful Clare Leach as Peggy with Michael Howe as Billy in the climax of that production, singing and dancing the bitter title song; what better lasting tribute to Gower Champion's sensational choreography. 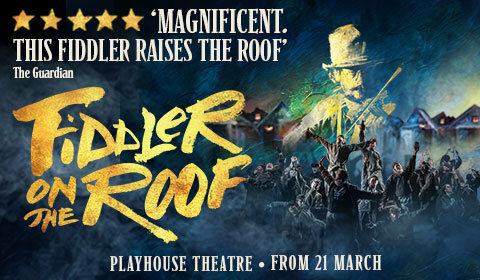 I couldn't get terribly worked up over seeing Trevor Nunn's revival of FIDDLER ON THE ROOF when it originated at the Menier Chocolate Factory as, while I admire the stagecraft that went into it's creation, it's not really one of my favourite musicals. But it's glowing reviews, it's transfer to the Playhouse Theatre - and the fact that I had seen every other show in the West End that interested me - meant that my birthday theatre event found me journeying back to the Russian shtetl of Anatevka in the early 1900s. In it's transfer to the Playhouse, director Trevor Nunn has reconfigured the stalls to echo his Menier staging so a raised meandering path runs through the stalls to bring you into the middle of the small Jewish town, it's a bit cumbersome in finding your seat but very effective and for once, I felt engaged with the show. 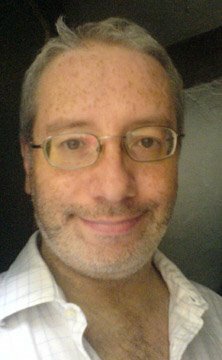 Of course being a Trevor Nunn production, it's very lengthy which for me only highlighted the repetitions in Joseph Stein's book, but as I said, I was engaged. I have only seen the show once before onstage - a jaw-dropping 14 years ago in New York in a Chekhovian production directed by David Leveaux starring Harvey Fierstein and Rosie O'Donnell - and, of course, the Norman Jewison film version starring Topol. As I said, it's not a particular favourite of mine, mostly because I find the plot device of a Jewish village milkman finding the traditions he lives by erode through his three daughters marrying against his wishes too repetitive. I will agree that this is done by degrees: the first falls in love with a nebbish Jewish tailor, the second to a Bolshevik, the third to a gentile - but, particularly in this production, the three daughters are played exactly the same, sound exactly the same - typical west end soprano - and are so resolutely two-dimensional, that it's like you are seeing one actress on a revolve. The three boyfriends are all given different shadings but the daughters get no personalities at all. I also am not the biggest fan of Jerry Bock and Sheldon Harnick's score which has it's standards - "Tradition", "If I Were A Rich Man", "Sunrise Sunset", "Do You Love Me" - but otherwise I find it fairly anonymous and repetitive. But as I said, I found Nunn's production to be involving with very good musical direction from Paul Bogaev which serves the score well, apart from the endless "Tevye's Nightmare" which proves that time is not always a continuum. 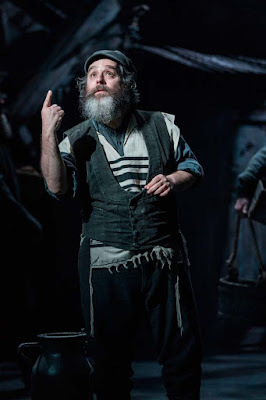 Nunn has chosen Andy Nyman for his Tevye and he is excellent, making him a very human-sized character, unlike the usual Star turn from actors taking their lead from the originator of the role, the larger-than-life Zero Mostel. 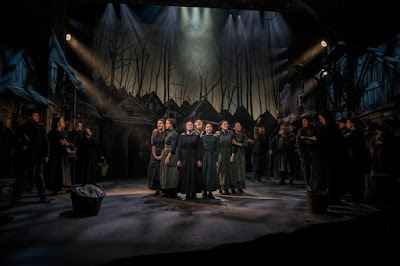 Without the character being figuratively spot-lit downstage while the other actors huddle upstage, it makes for more integrated story-telling with the town of Anatevka coming fully to life. 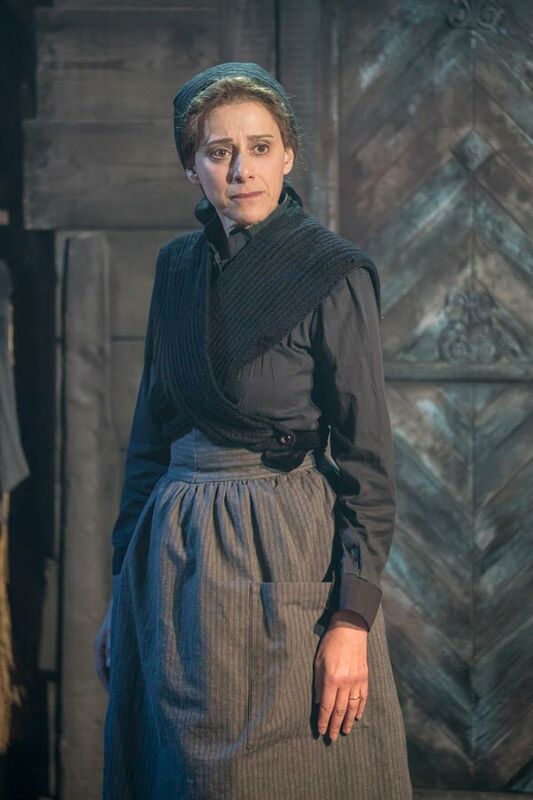 Like the daughters, the role of Tevye's wife Golde is a fairly thankless one; for ever careworn and kvetching at her husband's foolish dreams, but Broadway actress Judy Kuhn suggested more depth to the character than is on the page. In particular the duet "Do You Love Me?" 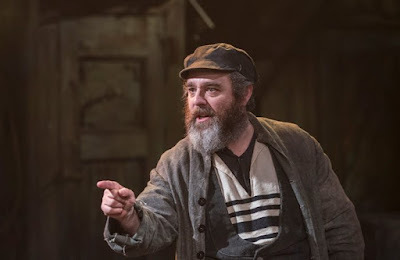 where Tevye finally plucks up the courage to ask Golde whether their 25-year marriage is based on love or just circumstance is a touching, almost embarrassed moment between Nyman and Kuhn rather than being played for comedy. 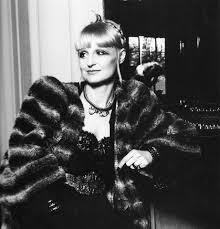 The other stand-out in the cast is Louise Gold as Yente, the gossipy matchmaker of the village; another two-dimensional female character but imbued by the ever-reliable Gold with a vibrant personality who again had colour and depth that was not suggested by the script. I also liked Stewart Clarke as Perchik the stern Bolshevik student who is smitten by the middle daughter Hodel. Of course the spirit of Jerome Robbins, the show's original director/choreographer, is ever-present in the big dance routines for "To Life" and "The Wedding / Bottle Dance"; for a man who has been dead 21 years, it's not bad that he gets named three times on the poster. Matt Cole is responsible for the rest of the enjoyable choreography. 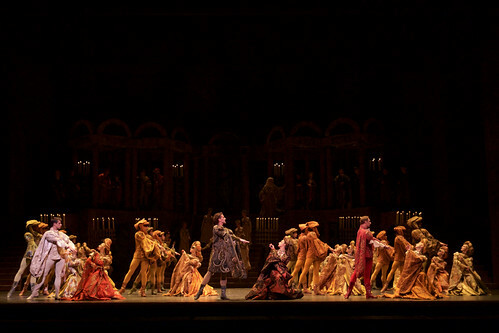 Robert Jones' set design brings the crowded Anatevka to vibrant life both onstage and off, while Tim Lutkin's subtle, shifting lighting gives the town the warmth of summer and the dark of winter. None more so than in the final scenes when the mood turns sombre with the forced eviction of the Jews from the town. Despite my problems with the show, it is impossible not to be moved by the final scene where lifelong friends and families say their goodbyes knowing they will probably never see each other again as they scatter over Europe and America. 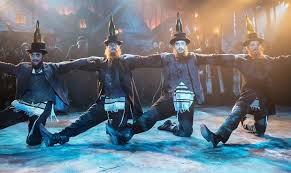 As the snow falls on Tevye's shattered community slowly trudging out of their hometown, clutching their few possessions on a long journey to who knows what fate, Nunn shows his production is sadly very relevant to today's world of displaced people and the search for home in a world of prejudice and fear. 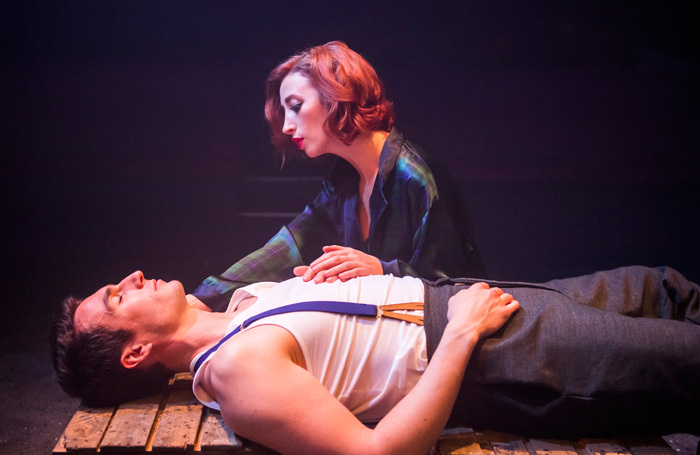 MAGGIE MAY at the Finborough - Wake Up Maggie... you're onstage again. Four years after the life-changing success of OLIVER! - which was still running in the West End - Lionel Bart's new musical MAGGIE MAY opened at the Adelphi Theatre in 1964. 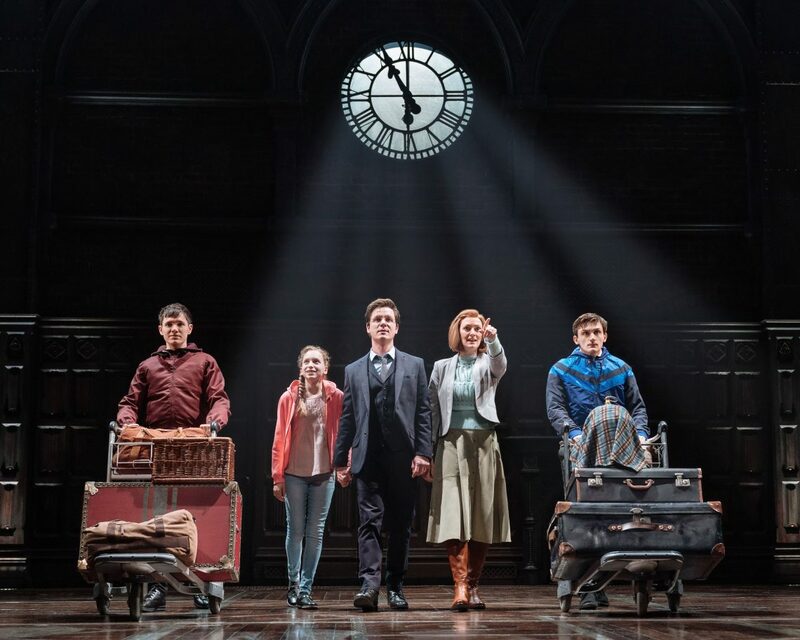 Despite winning the Novello award for Best Theatre Score and a Critics Circle award for Best Musical, the show simply vanished from the repertoire. Our Liverpudlian heroine appeared briefly in 1992 in a National Youth Theatre production but the revival at the Finborough Theatre is it's first professional appearance in 55 years. Bart was still riding the success of OLIVER! 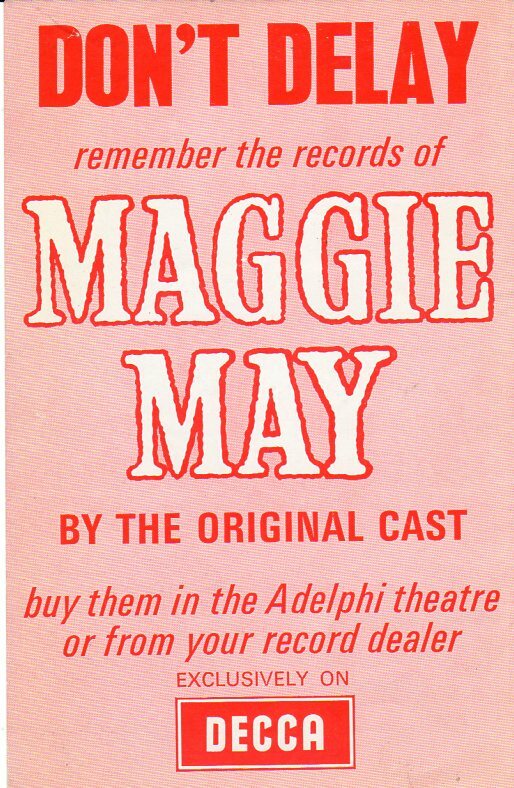 when MAGGIE MAY became his second consecutive show to open at the Adelphi. His 1962 musical BLITZ! - whoever said exclamation marks were a recent way to denote a musical - had opened there for a moderately successful run but was judged to be an uneven show; Sean Kenny's collapsing East End London set garnering the most attention over Bart's score or performances. Returning again to the working-class milieu that had proved so successful for him, Bart turned away from London and focused on the thriving Liverpool scene, collaborating with writer Alun Owen who had success with his Liverpool plays PROGRESS TO THE PARK and NO TRAMS TO LIME STREET, and had just won acclaim for his script for A HARD DAY'S NIGHT. Bart's favourite designer Sean Kenny recreated the Liverpool docks setting, while Owen was reunited with Canadian director Ted Kotcheff who had directed his plays on stage and television. The show reunited Bart with Barry Humphries who had appeared in London and New York as OLIVER''s Mr Sowerberry - here playing the Brechtian role The Balladeer - and the show starred Rachel Roberts as Maggie May and Kenneth Haigh as Patrick Casey. 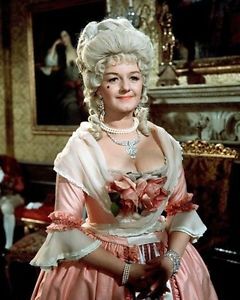 The cast also included such future tv names as Morecombe and Wise 'star' Janet Webb, Geoffrey Hughes, Billy Boyle (currently appearing as Theodore Whitman in the National Theatre's FOLLIES) and in the chorus, making her West End debut, Julia McKenzie. 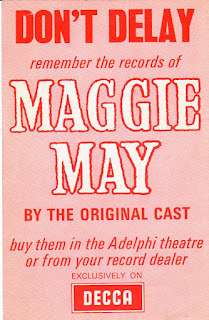 MAGGIE MAY not only had a cast recording but Bart's friend Judy Garland also released four of it's songs on an EP. In an odd twist, Bart had originally offered OLIVER! to Rachel Roberts but she declined so Georgia Brown got the role; he then offered MAGGIE MAY to Georgia but she declined so Rachel Roberts got it! Non-singer Roberts' vocal chords just about survived to the end of her contract where she was replaced by - you guessed - Georgia Brown. 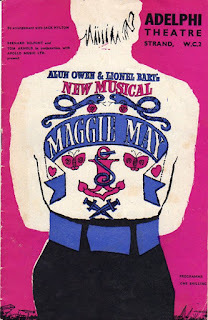 MAGGIE MAY was Bart's last hurrah however: his 1965 musical TWANG!! was a theatrical car-crash and his 1969 Broadway musical LA STRADA not only had most of his score ditched but closed after a single night. To finance these disasters, Bart had stupidly sold the rights to his hit shows - Max Bygraves paid £350 for OLIVER! 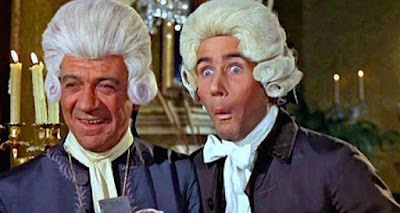 and then re-sold them for £250,000 - so by 1972, Lionel Bart, the once and future king of British musicals, was bankrupt and suffering from alcoholism and substance abuse. 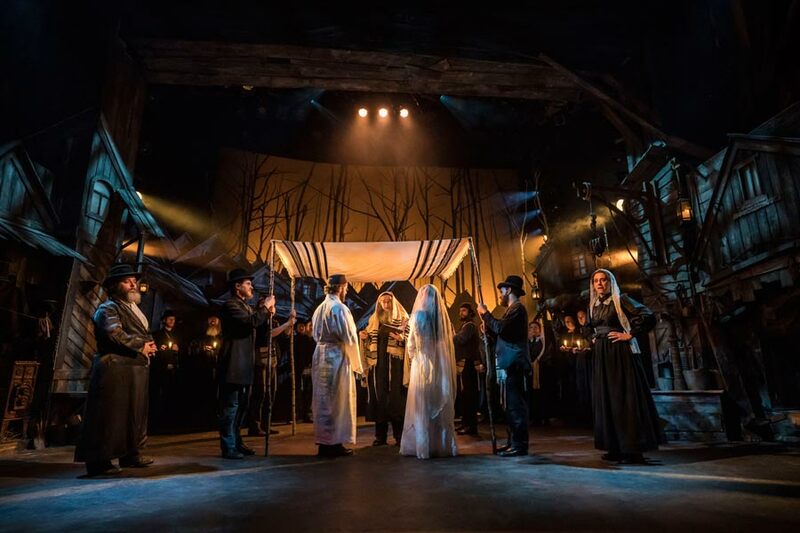 He re-awakened public interest with his Abbey National jingle 'Happy Endings' in the late 1980s, and in 1994 - the same year that MAGGIE MAY's Alun Owen died - Cameron Mackintosh revived OLIVER! with Bart making additions to the score for which he received a share of the profits. He died in 1999 of liver cancer. OLIVER! has had many revivals since it's 1960 opening - largely thanks to the enduring popularity of the 1968 film adaptation - but his other shows have been overshadowed. Interestingly, his two 'contemporary' scores - FINGS AIN'T WOT THEY USED T'BE and MAGGIE MAY - are certainly influenced by his parallel career as a pop songwriter so maybe sound dated to theatre producers today; but they also carry within them an earthy, vital spark that didn't see it's like again until Willy Russell's BLOOD BROTHERS. Maggie is a vivacious tart with a heart whose inner sadness, at losing her childhood sweetheart Patrick Casey to the life of a sailor, results in calling all her punters 'Casey'. 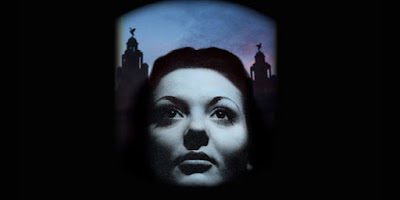 She lives and works near the Liverpool docks with her salty friend Maureen, and one day word reaches Maggie that Patrick Casey has arrived back, having left the navy for good. They meet again and immediately realize they were meant to be together. Patrick's friend Judder gets him a job on the docks but for Patrick this is a poisoned chalice; his father Joe was a famous trade unionist and rabble-rouser, loved by the workers and hated by the bosses. His death at a demonstration has made him a legend and Patrick finds this a burden to carry with his fellow-workers who expect so much of him. However when a worker is killed by a falling crate Patrick shows he is his father's son; not so much for the death but for the fact that the crate contained a secret shipment of guns, bound for South America which Patrick knows will be used against striking workers. This leads him to confront his father's former crony Willie Morgan who is now the corrupt head of the docker's union. Morgan knew the guns were being shipped as it meant jobs for his men but Patrick accuses him of class treachery. Willie realizes Casey could easily displace him so decides to ruin him... and the key to this is through Maggie. 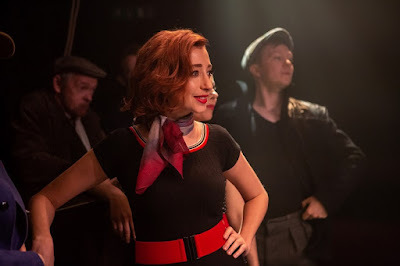 More guns arrive dockside and Casey's gang are assigned the job; Casey refuses and is sacked but Judder whips up the fellow dockers to walk out in support of their new hero Patrick, only Maggie realizing that this can only lead to more trouble. She warns Patrick about going up against Morgan but he persists on addressing a large strike meeting about the need to be united with other world-wide comrades. Morgan speaks next and manages to turn the strikers' against any further action - why think of others when your own job is on the line? Morgan makes a move on Maggie knowing she is unhappy with Patrick but despite a trip to the fair, she rebuffs Morgan knowing that Patrick is her real love. 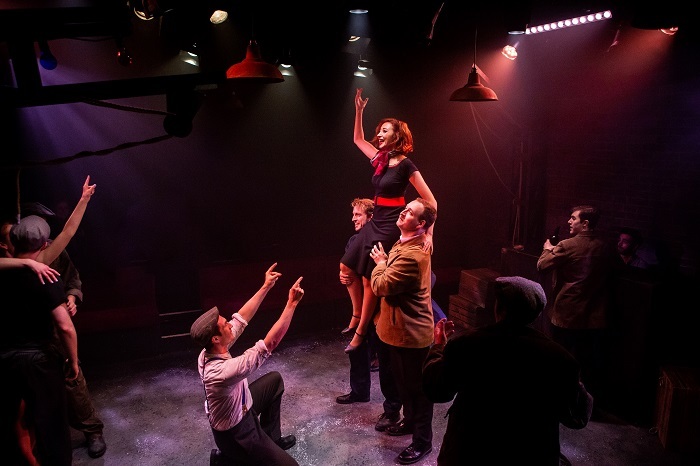 MAGGIE MAY does feel uneven: Alun Owen's blue-collar book addressing trade union corruption and the in-fighting workers is a natural for his "Armchair Theatre" tv plays but sit oddly against Bart's score - both are good but play like a cut-and-shunt job. 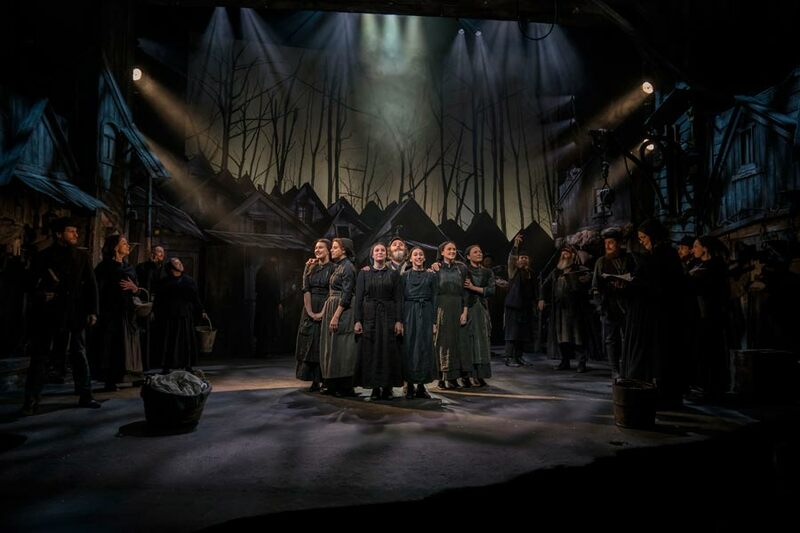 However a little doctoring could give both a better flow; what is remarkable is to see a musical so committed to showing the working-class experience - how often does that happen? There is a problem with the character of Maggie, a vibrant live-wire at the start of the show, she dwindles towards the end of the show to become a mere bystander to Patrick's fate. 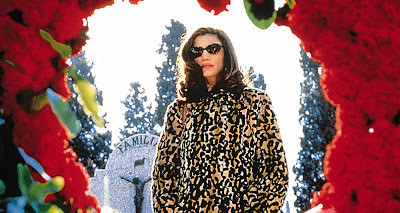 The ending feels like a conscious steal from WEST SIDE STORY with it's sudden tragic conclusion but this too demotes Maggie to being an onlooker in what is supposed to be her story. Matthew Iliffe's production is constrained by the small auditorium - the Finborough seats only 50 at a squeeze - allowing only a few small crates and a movable metal staircase as a set but the possibilities for the show do come through in his focused and fast-moving show, eliciting strong - sometimes too strong - performances from his cast. James Darch was excellent as Patrick, a natural leading man with a strong voice and easy charm and he was well-partnered by Kara Lily Hayworth as Maggie, my only complaint being that her singing voice, while pretty in the current theatre soprano way, probably didn't give Maggie's songs their best as they were written for a rougher, more belting voice like Georgia Brown's. A special mention to the hard-edged Maureen of Natalie Williams, the rest of the cast were all ok but Michael Nelson as Judder for some reason shouted rather than speaking his lines which seemed absurd in such a small space, however he was an excellent dancer, easily the one to focus on during the punchy and dynamic dance numbers choreographed by Sam Spencer-Lane to *just* fit the space. Lionel Bart's score had several of his trademark numbers - the big ballads for his leading lady, a solo for his lead man reviewing his situation, ensemble numbers, a few comedy routine numbers and, kicking off the second act, an early sixties rock 'n' roll number that Cliff Richard wouldn't have turned his quiff up at - a very special mention to Henry Brennan, playing the whole score on a piano. 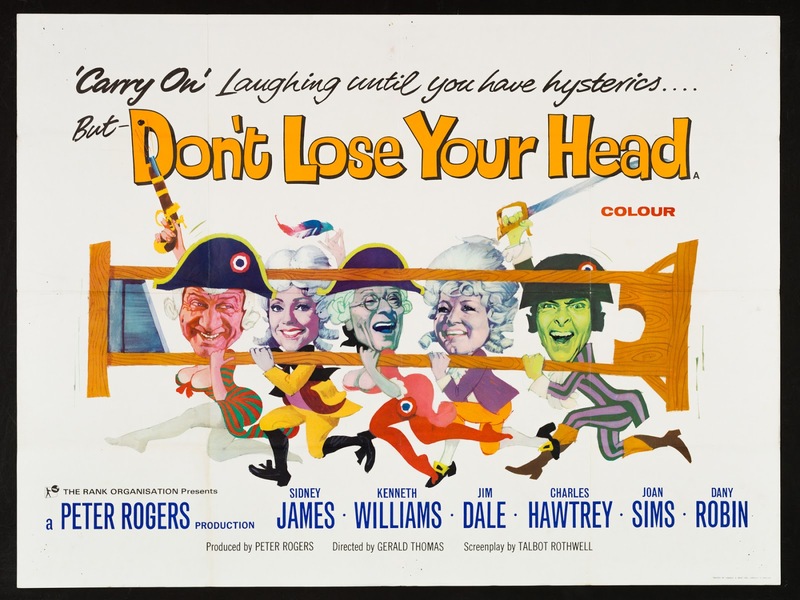 I honestly thought I would never see a revival of this but I am glad I did: for all it's uneven qualities, it's possibly one of the UK's most over-looked musicals. Congratulations to Matthew Iliffe and his cast of 13 (where the original cast hit 50! 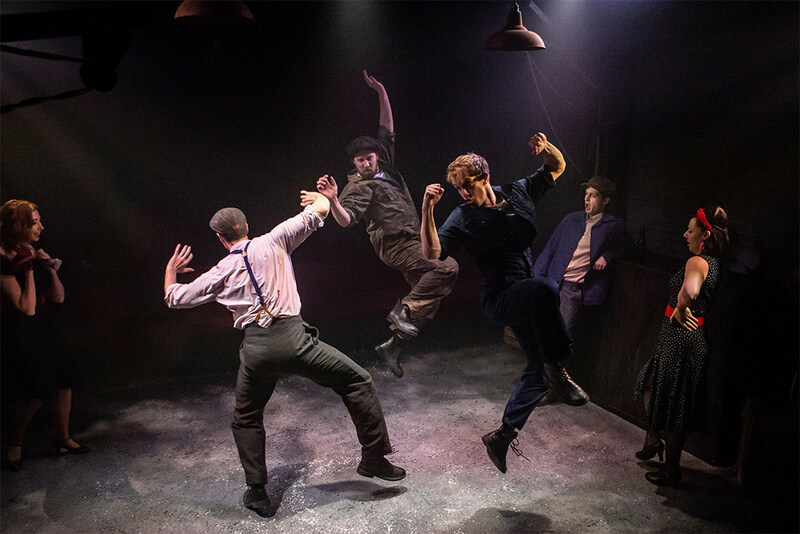 ), MAGGIE MAY is now sold-out for it's run at the Finborough. But here we are, in the Dress Circle of the Palace Theatre, as I said a veritable barn of a place that could have served as an inspiration for Hogwarts with it's dark gloomy spaces and Gothic pretensions, and the good news was that, despite my fears of having restricted view seats towards the end of the third row, they gave a very good view of the large open proscenium arch stage. Quite right too for the prices I paid. Despite my anathema for the Harry Potter films, I must admit that I got quite excited waiting for the play to start: HARRY POTTER, along with HAMILTON, have made the mere attendance of the show an event, so sitting and waiting for the start could only be a combination of relief to finally be in the seats booked ages ago and to get the vibe from the audience that you are in the auditorium of a copper-bottomed hit. I must also admit by the end of the first play I was fully on-board - John Tiffany's production moves along at quite a breathless pace and the sheer theatricality of the piece was what I enjoyed most: illusion, slight-of-hand, the simple Black Theatre of Prague techniques all contributed to a show - that like the best of all theatre - allows you to use your imagination while watching, the direct reverse of what the films did which allowed for no imagination as everything was CGI-d for you. The production has the feel of a musical - the on-stage action is deftly choreographed by Steven Hoggett, which sweeps you along with the characters inter-actions with each other and the sets - I particularly liked how just some snap-to-black lighting and the ensemble's swirling capes transitioned one scene to another so effectively. 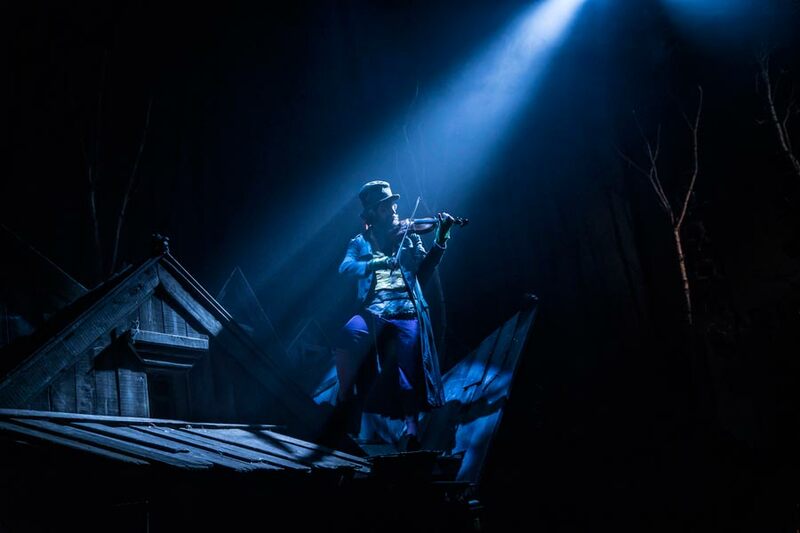 Last year we saw John Tiffany and Steven Hoggett's PINOCCHIO at the National which, compared to POTTER, seems even more clunky than it did at the time. 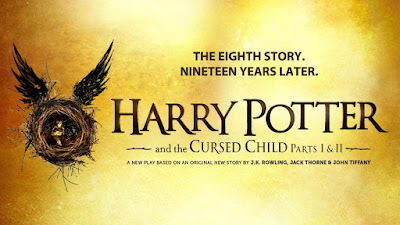 The programme helpfully gives you a potted Potter synopsis of all the stories up until the start of the play: 19 years after Harry's defeat of his evil nemesis Voldemort, he is grown up and employed by the Ministry of Magic. He and his wife Ginny send Albus their youngest son off to be educated at Hogwarts and, while travelling, Albus makes friends with another new pupil, the shy yet gushing Scorpius. Much to Albus' surprise, he discovers Scorpius is the son of Potter's former bully Draco Malfoy. Albus and Scorpius find life at Hogwarts hard as they are forever compared to their more illustrious fathers which makes the friends bond all the more special. 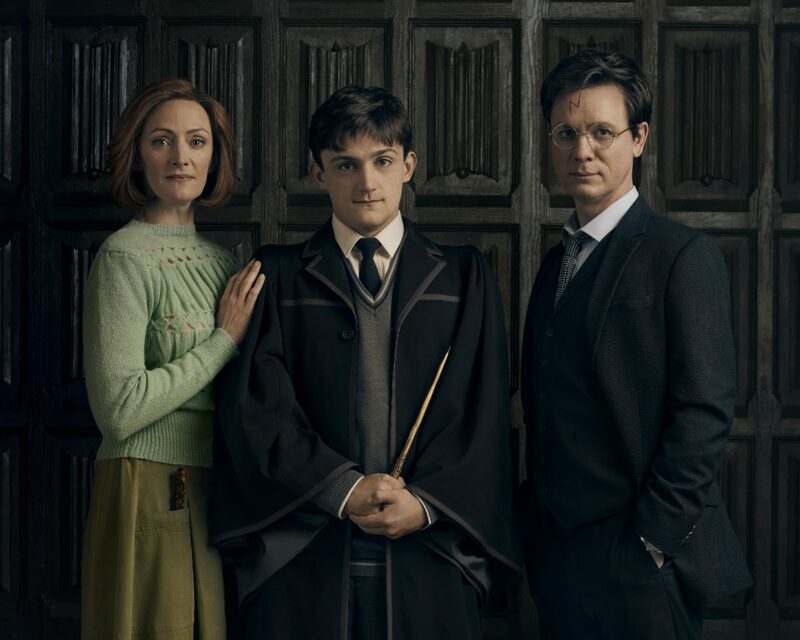 Harry is approached by the father of a contemporary of his at Hogwarts who was killed by Voldemort; the old man has heard of the existence of a time-travelling device which could be used to save his son from an early death. Harry refuses but Albus is determined to help him and his anarchic niece Delphi. Harry is confused at the growing estrangement from Albus and is worried from auguries that something evil is approaching. 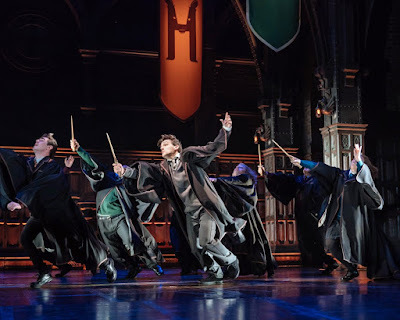 The boys steal the time device from the office of Harry's school-friend Hermione, and twice attempt their mission; however both times end with them interfering with time altering the reality of their present day. On the second attempt, Scorpius finds himself trapped in a reality where Harry was killed by Voldemort who reigns supreme. The first play ends on such an unexpected note of the evil world manifested to the terrified Scorpius that it really send you out desperate for Part 2 - the final coup de theatre is breath-taking, generally eerie and - as the free badge we received as we left the theatre asked us to #keepthesecrets, I will. The second play sadly runs out of steam and is not as dramatically involving as the first. The second play seems full of repetitions and the culprit who is allowing the coming evil to happen is very obvious. Indeed, even the final confrontation between Potter, his old friends and the spirit of Voldemort, doesn't quite work. Both fathers and sons - Harry & Albus, Draco & Scorpius - are finally reunited however but this also threw up a quandary for me. For a hugely successful female writer JK Rowling is oddly resistant to showing any connection between her female characters: Ginny Potter is a standard worried mother, Hermione - while in a position of power - has hardly any connection with her daughter Rose who starts out with Harry and Scorpius but who soon vanishes for large sections of the story, while Delphi remains firmly obsessed with her father. So the only real female character who appears to have any tangible connection to Harry is his mother... who's dead. 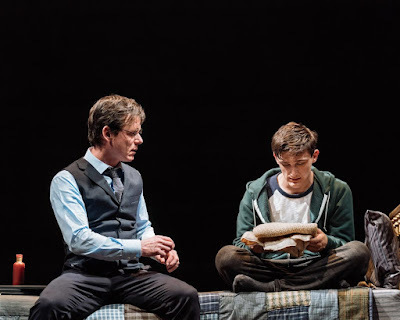 When the relationships in the play buzz around the subject of the burdens placed on fathers and son relationships, the women in essence are not allowed any such soul-searching. Strange. As I said the second play cannot keep up the pace of the first and it left me with the feeling that writer Jack Thorne could have been more concise with his, Tiffany and Rowling's original story - but whoever heard of a production taking place over one full play and a second first act? There just seemed to be a lot of padding to get to the climax of the second play. In juggernaut productions like HARRY POTTER there really is no need to cast star names but the performances were by-and-large good: Jamie Ballard was good as the troubled Harry while Joe Idris-Roberts was very good as his equally-troubled son Albus, oddly enough we last saw him as another growing boy with father issues for John Tiffany in PINOCCHIO. Thomas Aldridge was fine as the plain-speaking Ron Weasley but Franc Ashman as Hermione frequently sounded clanging notes, however Helen Aluko showed spirit as their daughter Rose - so much so that I wished she had more to do. But by far the most eye-catching performance was Jonathan Case as Scorpius, in his first professional role. 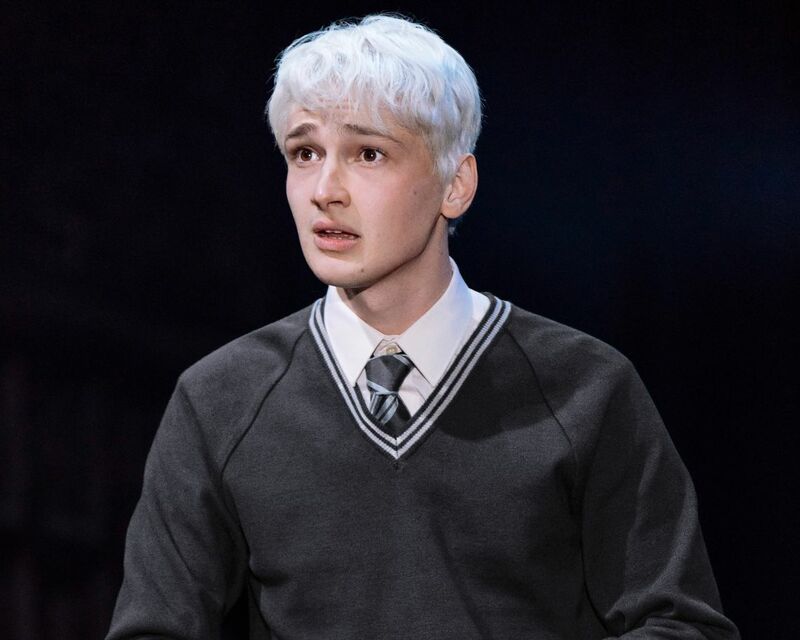 Although he pushed the gurgling, bashful, tongue-tied Scorpius to almost Boris Johnsonian levels, he connected to the role perfectly and made him more of a central character than either Potter, with a more interesting character arc. The true stars are however the production team: Tiffany's direction allied to Steven Hoggett's movement, Christine Jones' sets, Katrina Lindsay's costumes, Imogen Heap's score, Neil Austin's lighting and the illusion effects of Jamie Harrison; all combine to give a unique theatrical event and a genuine celebration of what theatre - and only theatre - can do. An intimate - and maddeningly short - documentary of designer Barbara Hulanicki, which sketches her life as swiftly as one of her fashion drawings. 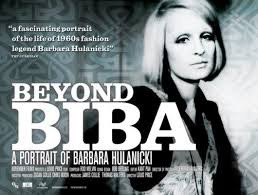 Filmed in Miami, where Barbara has resided since 1987, she prepares for a London drawings exhibition while reminiscing: Polish-born, she moved to Jerusalem in the 1940s with her diplomat father, only for her life to change aged 12 when he was assassinated by Zionists. Growing up in England, Barbara was working as a newspaper fashion illustrator when the Daily Mirror asked her to design a day dress - her design in pink gingham, costing 25 shillings, resulted in over 17,000 mail order requests! Barbara and husband Stephen Fitz-Simon opened Biba in 1964 which in it's third move became Big Biba on Kensington High Street: where seven floors offered it's customers, for the first time, a whole lifestyle - clothes, furniture, food. make-up, dog food - at affordable prices. Shelf or charity shop? 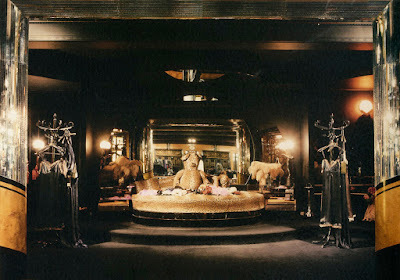 Big Biba is one of my most treasured memories of growing up in Kensington in the 1970s so this is obvious to keep! 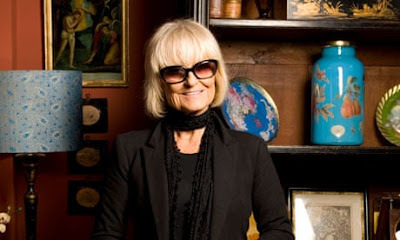 It is also interesting to follow Barbara's post-Biba career designing hotel and restaurant interiors in Miami, and to see her meeting old friends like Twiggy and Molly Parkin. Robespierre's Reign of Terror is interrupted by the elusive Black Fingernail who, disguised, rescues aristocrats from the guillotine and under the snooty nose of police chief, Citizen Camembert. 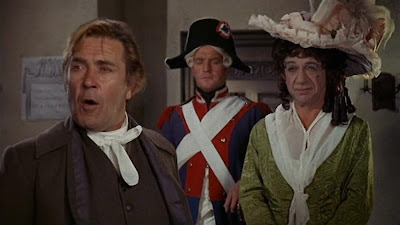 The rescuers are two English fops, Sir Rodney Ffing and Lord Darcy Pue so Camembert journeys to England to catch them with his bumbling assistant Citizen Bidet and his mistress Desirée. DON'T LOSE YOUR HEAD, despite the tsunami of double entendres, runs out of steam about two thirds in and never recovers. 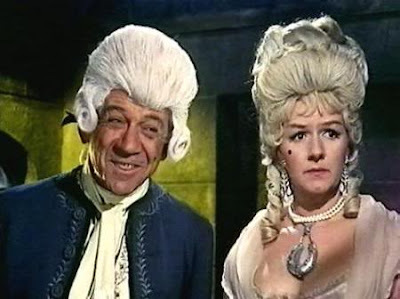 Sid James is fine while the anarchic pairing of Kenneth Williams and Charles Hawtrey fizzes and Joan Sims is glorious as the outwardly-'refained' but common-as-muck Desirée.